PA systems are an important piece of kit for anyone looking to head out on the gig circuit, or make a statement at a public speaking gig. The right sound system will help to amplify a voice and/or instruments with clarity and depth across the room. Solo users will also find that user-friendly, portable models are much more beneficial in these circumstances. Anyone travelling between shows on their own needs to know that they have a reliable, transportable model that is easy to set up. 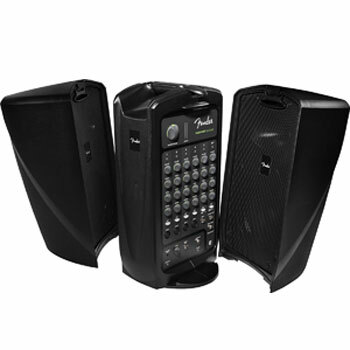 What should buyers look out for when choosing a top rated portable PA sound system. The first consideration when looking for the best portable PA system for your needs is that aspect of portability. What exactly is it about this model that makes it so easy to transport? The weight and dimensions are an obvious starting point here, but so is the inclusion of any handles, transport wheels and other helpful aids. The other thing to thing about with this model is the sound quality. Is the sound compromised in favour of a more compact model? Does it have all the inputs and outputs needed for the performance? It helps to check for any additional features and the levels on the bass and EQ. Some of the best portable PA speakers around right now. Fender is a name that many musicians will turn to for their amplification needs. This is true for small-scale set-ups as much as high-end ones. The company has created a series of small, portable models in what they call their “passport” series. The first of these to consider here is the Passport Event. This is the mid-range model. The specification looks pretty good for a powerful performance and great set. Musicians, especially singer-songwriters, should be happy with the output and design. 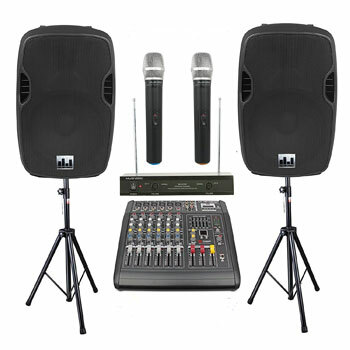 It offers 375 watts of power with an integrated seven channel mixer. There is also a Bluetooth wireless stream to allow user to connect up to mobile devices. Portability comes from the clever suitcase design. It all packs away into one neat unit and flips open with quick release latches to reveal the speakers and system within. 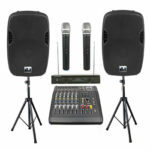 It should be suitable for small events in clubs, coffeehouses and meeting rooms. Yamaha is another company with a great reputation when it comes to great sound and performance. Again, there are two different versions of a top model to look at here. The difference in power and performance could help you determine precisely what you need for your own performances needs. The first is the Yamaha Stagepas 400I. 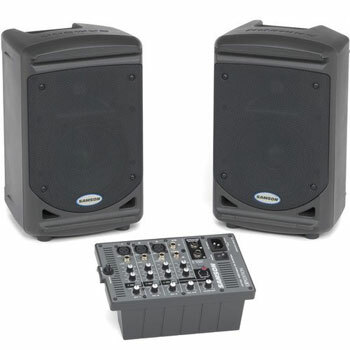 Both versions of the Stagepas portable pa system have a strong focus on portability. Rather than pack everything in one case, like Fender, there are two lightweight speakers with helpful handles, and a detachable mixer. This makes it a little easier to handle and set up for those that don’t want a heavy case to carry. Still, this might take more than one trip from the van. This 660I version is the more powerful model with the broader specification. There are 10 channels in the mixer board, 3 bands of EQ, a 10’’ woofer and 680w of power. There is great potential here for small gigs. Fender and Yamaha are not the only brands to look out for when choosing a top rated portable PA system. 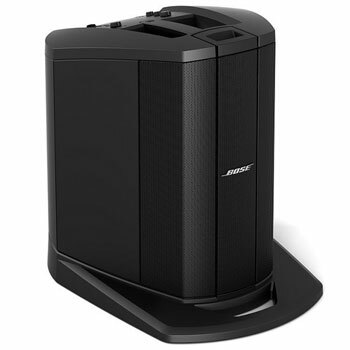 Bose also has a great reputation for sound quality within many of its speaker systems, headphones and other products. 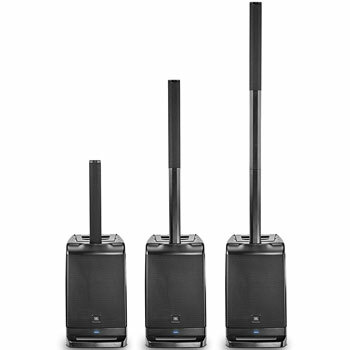 This top rated portable PA system promises great spatial dispersion of sound for an even approach across the room. This means that those at the sides of the room should get the same listening experience as those in the middle. This is perfect for crowded parties and popular shows. There are also additional benefits here with the two tone match channels with preset features for an acoustic guitar and microphone. 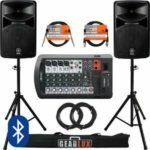 This adds to the ease of use for solo performers, as does the choice of a compact or extended set-up, depending on the venue. This adds to the idea of “one-trip” portability, as does the collapsible nature and padded carry bag. 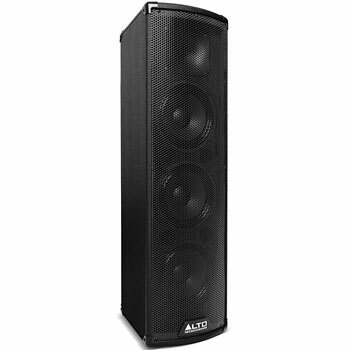 This Alto Professional PA system is a pretty lightweight model compared to some of the other models here. It weighs it at just 23lbs, so should be easy for anyone to carry to gigs and stages. The portability of this models also comes from the built in handle. This makes it even easier to carry around between the van and the venue. Users should also appreciate the use of the rubber feet for stability on the floor, and the integrated pole socket for elevation. This may be one of the lightest models in this guide, but it is also important to note that it is also one of the weakest in terms of power. There are just 200 watts here for small venue applications. It offer 6.5’’ woofers, 2 bands of EQ and 3 channels on the audio mixer. This is nothing special, but there is the additional bonus of the Bluetooth connection for extra feeds. All the controls and mixing board are built into the back of the device, adding to that ease of use. 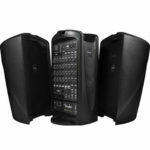 As the name suggests, this Fender Passport Venue PA System beefs up the specification and the range to handle a larger venue rather than a small event. The sound carries further into bigger spaces, so this is a great upgrade on the Passport Event. The portable PA speaker remains the same, but it is a little heavier than the event model – 60lbs rather than 57.5lb. Still, it is not that heavy and should be manageable. The Venue is highly recommendable for those looking to branch out with bigger bookings and larger venues. Users that are familiar with the Fender Passport set up shouldn’t have any problems with the features and controls as the approach is similar. There is a little more power with 600w rather than 350w. There are also 10 channels on the mixer, rather than 7, as well as a strong reverb and effects on vocals. 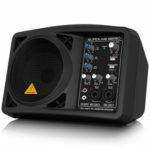 Portability may seem like a little bit more of a problem with this PA speaker because of the complexity of the package. The Alto model above is as simple and stripped back as possible with nothing but the one unit. That all-in-one design is appealing to solo performers that don’t want to miss with multiple items. The alternative is a more inclusive package of items like this Musysic system.This isn’t the “one-trip” approach of other PA systems, but it isn’ t that heavy or difficult to handle either. Here there are two large speakers with their own stands, a 6 channel mixer, two microphones and all the necessary cables. This is a great set up for those looking for a more complete package when heading out on the road. The added bonus here is that this is a 2000W sound system from relatively small speakers. This means that users can play larger venues. Power capabilities clearly vary greatly between these different top rated PA systems. On one side of the coin you have those like the MUSYSIC model above with that combined 2000w power from the two speakers. Then there are those on the opposite side that are much smaller and weaker for different needs. Here there is a tiny device with a small built-in speaker that is just 150w. This means that there are limitations on the applications. Some will find that it works fine for small speaking gigs and as playback in home recording studios. The all-in-one design and ease-of-use mean that set-up and disassembly are easy for these speaking engagements. Musicians in small venues may struggle a little more to get the coverage and clarity they need. The appeal here lies more in the 3.2kg lightweight and build than the sound. Even so, this small, portable Behringer Eurolive B205D PA System has a 5.25’’ driver, 2 mic preamps and an instrument ready input. 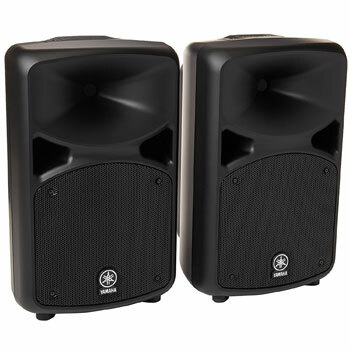 As mentioned above, the Yamaha STAGEPAS 400I is the more subdued version of the STAGEPAS for a smaller set-up and those in need of a little less power. This doesn’t make it any less appealing, it just limits the capabilities in larger spaces. Besides, 10 channels and 10’’ woofers can be too extreme in more intimate surroundings. This is where this Yamaha 400I option can help. This is a 400w model, rather than 680w, has an 8’’ woofer, 8 channels on the mixer and 2 bands of EQ. This means that there is a little less going on, but it is not lacking in features by any means. The basics in the design and features remain the same. There is the same great portability in the weight and design, the easy-to-use detachable mixer and plenty of other great effects. It also offers a feedback suppressor, iPhone connection, reverb and a simple 1-knob system for the EQ. This ION Audio Block Rocker iPA76A Portable Bluetooth Speaker looks like a much more heavy-duty, powerful system compared to some of the more compact items in this list. It is large with lots of features and applications for different needs. Yet, it is still classed as a portable model because of the helpful additions of the wheels and handle. Users can essentially wheel it around like they would a suitcase. This means that any additional weight that may come from the casing is inconsequential. Some users will be drawn to this model because of its links to mobile technology and its charging station. Users can enjoy NFC connectivity to set up streams from mobile devices, and then charge that device with the USB power bank. This is ideal for those providing music at a party that aims to run all night. There is also a built in radio, microphone and an app to change the EQ. This is a little different in its aims, and more tech-focused, but still offers great potential for the right user. The other model in this list comes from Samson Technologies. This Samson Expedition XP150 Portable PA is another sound system that packs up into one simple, easy-to-carry device. The two speakers come together with the removable mixer to create a 24 pound unit. Instead of latches in a more rugged suitcase design, the speakers slot together at the back, with room for the mixing board. This may not seem like such as durable method without the case, but there is a high-impact plastic enclosure on all the important components. 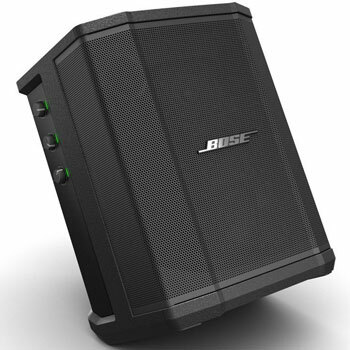 Each speaker has a 6’’ woofer and 75w of power – creating a 150w system overall. This means that this is another of the models on the weaker end of the scale in terms of power. It is more of an affordable, entry-level device for those starting out, rather than something more complex. It can work in small venues like coffeehouses, but its also great for rehearsal spaces and small speaking gigs. This JBL EON ONE Portable All-in-One PA System is similar in style and function to the Bose L1 model above. This is immediately clear from the sales photos that highly the tall adjustble speaker stack. That adjustable height is great for determining the range for the venue, as well as creating that compact, portable shape that users need while travelling. When packed up, the device is compact and weighs 40.8lb. This is heavier than some of the smaller devices here, but not the heaviest model around. The designers at JBL try and push their model ahead of Bose with the idea of a high-end linear approach with their adjustable speaker system. Theirs is a “patent pending” configuration that supposedly places the range and performance above that of competitors. The system also consists of a 6 channel mixer, 10’’ bass-reflex subwoofer and Bluetooth connectivity. 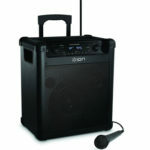 Choosing the best top rated portable PA system for your needs. There is a lot to consider when picking the right model for your needs. As you can see from the products above, they vary in style, size, power and purpose. Solo performers working small venues will do well with the compact, “one-trip” solutions with built-in components. They are easy to carry and set-up. 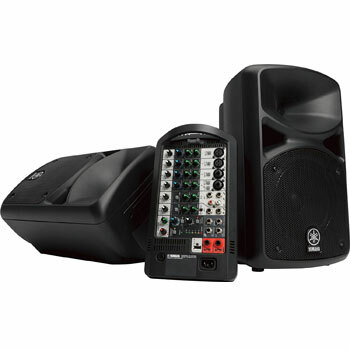 The best also offer a decent amount of power and clarity for the venue. Others will want to go a little more powerful and substantial with systems that are 600W or higher, with greater choices on the mixer. Make sure to check the weight and design for a truly portable model. Whichever style you choose, take the time to look at the specifications and reviews on the product. Make sure that it has the size and capabilities that you need. Also check user experiences for an idea of its true potential.